Binary Search tree is the most efficient data structure for solving different problems. Construction of BST (Binary Search Tree) depends on the order in which data is inserted into the tree. For building a Binary Search Tree, data should be inserted into a tree in a way that nodes with smaller data values appears on left side and larger node values appears on right side of the root node. You have to implement the above scenario using BST on the basis of Employee Id. i.e. if the Id of the Employee is lesser than the root node then enter the next Employee data in the left child otherwise in right child. 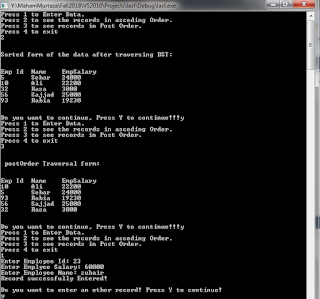 BST will implement using Linked List. Program will not allow entering duplicate employee id. Design the program in a way that the user will be able to enter maximum 10 records. Take empId, empName, empSalary from the user. At least 4 students record should be already entered (hard coded records). You will use following already entered Employees data (hard coded records). You will use buildBST() method to build Binary Search Tree from the above given data. Use the ascendingOredr() method to show the output in ascending order. With respect to empId. Use postOrder() method to traverse the records in post-order. outFile to be an ofstream variable. a rectangle. The number in the second line represents the radius of a circle. editing and recompiling), it outputs the appropriate results. e. Write statements that close the input and output files. f. Write a C++ program that tests the statements in parts a through e.
Below mention code is compiled in Visual Studio 2015 and Code Blocks 13.12,output snap is attached.. If any problem you feel and you want some explanation feel free to contact us. and their respective partners. I do not own this material, nor do i claim to do so. This material is only for educational purpose. Suppose that infile is an ifstream variable and it is associated with the file that contains the following data: 27306 savings 7503.35. Write the C++ statement(s) that reads and stores the first input in the int variable acctNumber, the second input in the string variable accountType, and the third input in the double variable balance. Write a program that will generate random numbers and that numbers will be stored in a two-dimensional array. 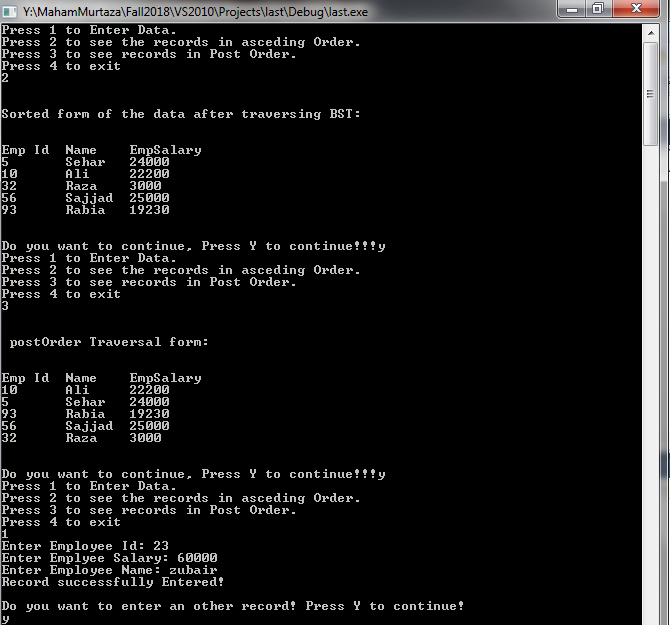 Then display the generated values on the screen and then also print the even numbers from the generated array elements. First of all, you are required to generate random numbers from 1 to 500. For this, you are required to create a function named as “generateArray. The generateArray will load two- dimensional array with random numbers from 1to 500. The size of the two-dimensional array will be 7*7. Defined a function named as “showArray(), which will display the elements of the two- dimensional array on the screen. See the sample output. The final task is to find the even numbers in this array and display it on the console. For this purpose create a function findEvenNumber().